The Indian or Oriental darter (Anhinga melanogaster Pennant, 1769) belongs to the order of the Suliformes and to the family of the Anhingidae. 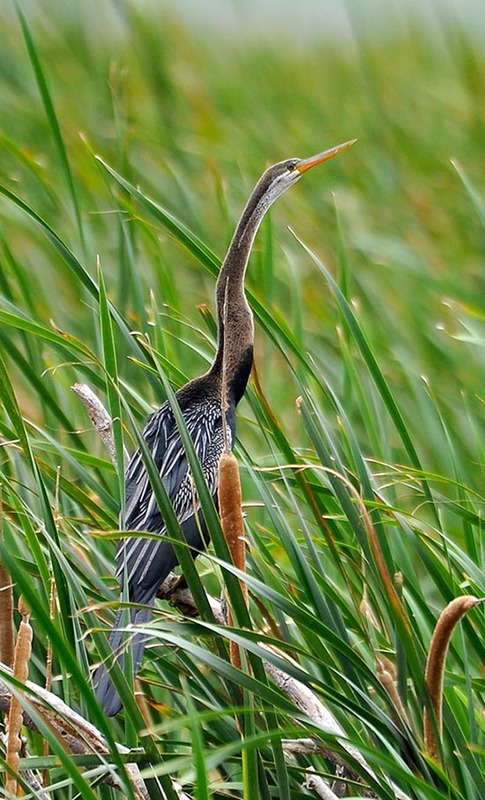 It is the member of this genus in the Indian subcontinent, distinguishing from the African darter (Anhinga rufa), from the American darter (Anhinga anhinga) e dall’aninga australiana (Anhinga novaehollandiae). Should they share the same territories, there would be a very strong difficulty in distinguishing them one from the other, as the size, the colours and the behaviours are practically the same. Actually, they live all very far from each other and their ranges are often isolated by ample territories not inhabited by these species, even if the Indian and the Australian ones instead come to touch each other but without overlapping. As has happened during these last decades, with the new classifications that have led to the revaluation of subspecies in species and the upheaval in the allocation of new scientific orders, also for the Anhinga melanogaster has occurred a particular modification of its status. It has not interested directly this species and the traditional locations but a subspecies, rightly the Australian one, that has been permanently separated and reevaluated at the upper level, classifying it as Anhinga novaehollandiae. 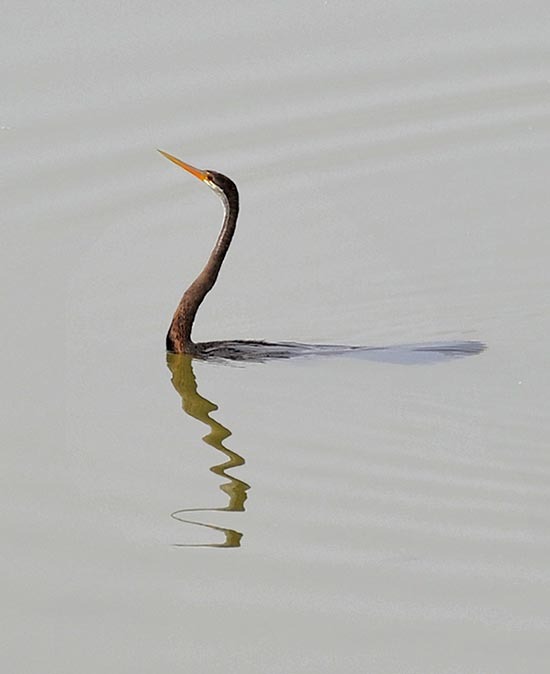 Also in India this bird is called snake-bird due to the particular posture it keeps when in water with the body totally immersed leaving exposed out from the surface and well spread, the long and very thin neck. Then being very common also in locations very frequented by the local population, that as we know is very sensitive to these reptilians for the dangerousness as well as for worshipping, we see that the tradition of the snake is much more pronounced than in other places. The neck of the darter has a particular structure between the eighth and ninth vertebra that allows this bird to use, like a snapping device, this strength to hit the prey piercing it with its spear-like bill. When resting, this conformation is well visible as an abnormal curvature of the neck. 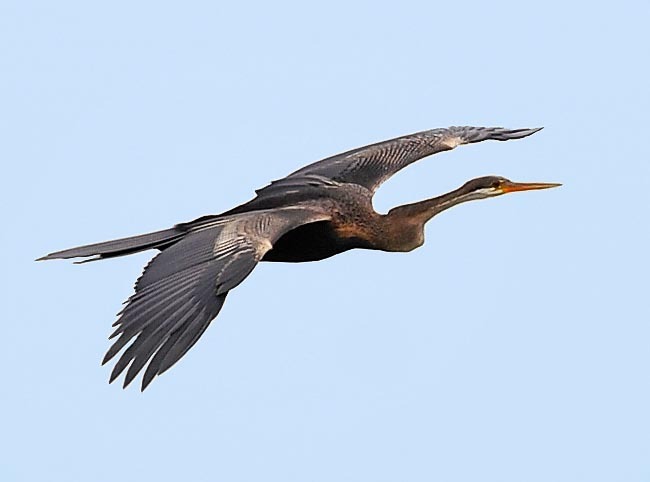 All the vulgar names given to this bird reflect its places of origin: in English Oriental darter; in German Orient-Schlangenhalsvogel; in French Anhinga d’Asie; in Spanish Anhinga Asiática; in Portuguese Mergulhão-serpente and in Italian Aninga comune or Aninga indiana or orientale. The scientific name Anhinga comes from an eponymous term of the tupi guaranì language, a linguistic stock of the Amazon jungle that has been a reference for many authors in the classification of numerous species of animals coming from that territory. The genus melanogaster comes from the Greek “melas” = black and “gaster” = abdomen or chest, due to the colour of its livery. Typically Asian species, it lives in Pakistan, India, Sri Lanka, Myanmar, in the whole Indochinese peninsula, in the Philippines, in Indonesia, up to the norther coasts of New Guinea and, south, the Moluccan Islands up to Timor Leste. This last boundary, New Guinea and Timor are limit ranges a times shared with the Australian anhinga (Anhinga novaehollandiae). It is not found north of the Himalayas and even less in the whole China. It is a sedentary species and does not perform any type of migration excepting small movements during the dry season while looking for new humid habitats. The Indian darter is a frequent visitor to the aquatic habitats, far away from these ones it is impossible to see it as it strictly depends from them due to the habits as well as to the food it gets from them. It lives along slow-flowing rivers in sheltered bends and with wooded banks, in lakes, also artificial, in swamps and in coastal mangroves wedged in deep bends in the hinterland and in any place where is present sufficiently high water for covering its immersions. It is often seen close to villages while fishing even a few metres far from the inhabitants while they are carrying out their usual activities. It is not rare to see it whil passing close to the women washing clothes or collecting water or others washing their animals, without any least sign of fear or awe. In some locations they have become an integral part of the daily life alongwith the ubiquitous cormorants with whom they cohabit without any social friction. With them, as soon as an underwater fishing has been done, perches then on the dry trunks emerging in the surface, spreading the wings to dry up the feathers soaked during the immersion. As a matter of fact, this bird does not have the habit of covering the plumage with oily fat as all surface aquatic birds do but leaves it absorbing in way to remain more easily under the surface without getting that strong upward thrust typical of the waterproof bodies. Then it is natural that for recovering the flying capabilities it has to dry up its livery as soon as possible. All the darters in the world have the same morphological characteristics and often also the colours are almost similar. The Indian darter is about 90 cm long, with a wingspan of 120 cm and a weight that may reach the 1500 g. The livery is typically dark, with black shoulders crossed in all their length by very thin whitish stripes, a black chest, hence the scientific name, reaching the chinstrap, a brown neck often similar to that of the African conspecific (Anhinga rufa) but that results also whitish or totally white in the juvenile liveries. When adult, is well visible on the neck a lateral white stripe that from the ocular line goes down for a twenty centimetres. A very long tail, black too, that has the task of the powerful rudder for its very fast underwater manœuvres. The bill is yellow, thin, very long and unbelievably pointed. A real foil for piercing the prey. The Indian darter nourishes mainly of fish but also of crustaceans, of water snakes, molluscs and big insects. There is little to add about the reproduction of this bird typically similar to its conspecifics of the other continents. It nidifies in very crowded colonies together with herons and cormorants, occupying completely the branches of trees that often wither due to the excreta emitted by them. The nidification period is usually the boreal summer with variations of some months for the single areas located at the extreme north and south of the ranges. It builds the nest on the banks of the bodies of water on the low branches or shrubs close or drooping on the surface. A coarse platform built with twigs and aquatic grasses on which it lays 3 to 6 bluish white eggs that are hatched by both parents for 30 days. The chicks remain in the nest for some weeks but often and during the frenzies that sometimes affect these overcrowded colonies, the young climb on the nearby branches often falling into the underlying water and invitably finishing victims of some predator. This species, unique in its genus, was frequently exploited by some populations on the Indo-Burmese borders for catching the fish. As even today happens for the cormorants (Phalacrocorax sp.) in the south of China, a ring was placed on the neck in way that, once the prey was seized, the same should not swallowed. Once taken the fish on board, the bird was rewarded with small fishes easy to swallow. The oriental darter is well diffused and present on all the territory and does not present any problem of survival. Its natural foes are, from the sky, some species of eagles and on the ground, crocodiles and large monitor lizards, but this is part of the normal natural collection. However, also the man interferes in their life with catches of eggs and chicks as foodstuff. In some rural areas, also its long feathers are often used as tribal adornments.